Meet Gags, the perfect WordPress theme to create gag, meme or other image sharing site using WordPress. 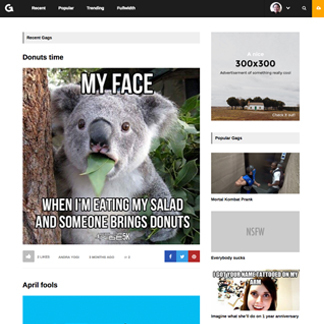 For short, you can create your own version of 9Gag with this WordPress theme. Gags is so easy to configure and use, need to change the colors and typography? Don’t worry, we got you covered, all colors and typography can be change from our theme options. Gags is also powered by our custom plugin that manage all the media users submitted. Oh, did we tell you that you can submit image and video? You can also add description to every gag submitted. To prevent spammers from registering, we add captcha functionality from Google reCaptcha. You also make it easier for users to register by enabling Facebook and Twitter login. Go head, checkout the theme preview so see how the theme works in our demo site.